How to run detailed version. Continuous distillation Stills vs Batch Stills. The first question that people asking is what the hell the continuous still is? The continuous still is a really fantastic machine where the mash flowing into the still continuously, and the ready spirit coming out of the other end plus the waste (spirit free ferment) constantly disposed into the drain. The continuous stills are not really suited for high quality spirit production but pot stills will not give you any good quality either. Continuous still in reality the medium between the fermentation vessel and fractional still thus instead of storing tons of mash you can work with a relatively small amounts of low quality raw spirit that could be stored for as long as you wish and it never will be spoiled. Now imagine that your distillery is limited in space but you have a few one ton fermentation vessels in the separate room, in case to distil one ton of mash in a pot still you will need at least 1.3 ton capacity pot still with all the arrangement follows, and it will occupy at least 2.5 cubic meters of space, will weight around 400kg (impossible to move around), you will have to fill it up with mash and preheat it - in some cases it will take up to 10 hours to get some first drops of spirit and another ten hours to complete distillation. Then you'll always know that there in the still one ton of boiling substance (scary) and if something goes wrong you will need to cool everything down and drain all the mash from the still, fix the problem and fill it up again once you are started your distillation you must complete it, and it can take up to 20 hours to complete. The spirit in the mash that is boiling for ten hours is getting involved in all kinds of chemical reactions because the mash is containing a lot of different by products of fermentation including salts and acids and all this reactions are boosted by heating - so the spirit that came out the still after few hours of distillation is not that good. When distillation is complete you will need to drain all the awfully smelling stuff and there are two options. First option is to drain all the awfully smelling stuff and get rid of it when it cools down and loose precious hours because it 's going to take a lot of time to cool it down. Second option is to dispose it while it is still hot and get a lot of steam and smell plus it is not really safe. The efficiency of pot still is low and natural loses of spirit during distillation is around 30%, thus at the beginning of distillation you will get the peak of spirit content in the distillate and during distillation the spirit percentage will drop drastically, it is means that you getting less spirit and more water, which was involved in the chemical reactions of fermentation and distillation and carried all the periodic table wit it into your final product. Thus there is yet another option: to stop distillation and loose some spirit or at certain point start to collect the stuff into the a separate vessel for the further re-distillation, but anyway some spirit will remain in the pot, a lot of precious space is occupied with machinery and a lot of time just wasted. This is reality of the pot still. In comparison with a pot stills the continuous stills are more compact and light constructed machines. but you have a few of one ton fermentation vessels in the separate room and to distil one ton of mash with a continuous still you will need a relatively tiny distillation machine that weight no more than 50kg under two meters high and occupies around 60cm2 of the floor area, which can be moved to the storage after distillation complete. The continuous distiller is connected to low pressure pump that constantly pumping the mash into the distiller and only couple of litres of mash is needed to fill the machine for distillation, and it will take only five to ten minutes for the machine to give you the first spirit. With the application of continuous still the speed of distillation will be determined by the size of the column and heating element in the steam generator, also a few columns can be arranged into one common frame and work together, the high speed production still on the video will process 900L of mash in just 6 hours, the spirit that constantly produced never has any contact with heating elements plus instead of boiling for hours in more and more concentrated by products of distillation it is separated from the stillage and in reality constantly washed with fresh portions of water steam, and as soon as separated from the mash the spirit is leaves the column and collected into collection vessel. When distillation is complete you do not have to deal with tons of boiling mash, the empty spirit free mash was separated and reduced to drain during distillation and if you are planning the next load of wash to be distilled - you just switch the supply hose to the next vessel and start your distillation in no time. The efficiency of continuous still (spirit vice) is close to 100% and in comparison with pot still you will get more spirit from the same load of the wash, the spirit percentage will stay the same from the start to the finish of distillation, and because the spirit in the continuous still is always bounded with fresh water this means that spirit produced with continuous still is almost free of those nasty chemicals that naturally occurring in a mash during fermentation. The work with continuous still will let you to start or finish your distillation just when you need it, because to preheat the column and get the first spirit will take only a few minutes, and also to finish the distillation will take a few seconds - just switch power off and carry on your distillation when you've got time to do it; it is like - today you get only two hours for distillation and tomorrow only four and you distilling today and tomorrow to complete your distillation and your mash is stays in the fermenting tank. Or your have got the arrangement with a few fermenting vessels that interconnected via the pipeline that constantly supplies the ferment to the continuous still and staff is working in thee shifts then the continuous still will produce the spirit 24/7. Thus no precious time and spirit is wasted at all which is very convenient. Despite of economical crisis some further work has been done and I am happy to admit that our continuous stills are getting a bit smaller, while there was some interest in a big machines that are capable to process enormous amounts of ferment many people were asking about some really small table top continuous still that can replace a bulky and heavy pot stills I don't want to repeat all the benefits of the continuous still over the pot still, but one benefit is obvious - size, thus the small continuous still, one meter high and 8kg of weight can replace a 500L (halve a ton) pot still, so for your primary distillation the continuous still is the must thing, on the picture you can see our latest creation: "Alex C.D/1.5" (stands for "ALcohol EXtracting Continuous Distiller 1.5kw") with this little beauty combined with Alex 25 or Alex 50 stills you can satisfy enormous thirst of all your friends, or supply your small business with all the products that can be made with distillation equipment. 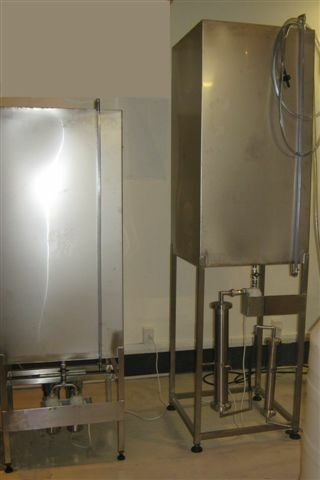 The stable continuous production speed of this continuous still is 3L of 50% ethanol per hour, the still is designed to be used as a primary distiller that continuously supplies the crude ethanol for fractional distiller to make a food grade ethanol free of impurities. This still has no boiler and the same as with the bigger versions of this still the mash ,beer, or wine is always stays cool in the separate vessel even in the separate room if you want so, you don't need to reload and preheat it (preheating time is 5min) you can start or stop your distillation any convenient time for you - just switch the pump and distil as much as you need without affecting the ferment. A home made video about this still is available on the top of this page.